I am a big fan of Scott’s Alien (1979). I think it is a truly fantastic thriller and one of the major reasons for that is because its easy to understand. Sure, you can have sci-fi movies like Christopher Nolan’s Inception (2010) where every detail is thought-through and every moment carefully devised and, as difficult as it may be to understand in real-time, I walked out of the theater completely understanding everything and the more you think about it, the less plot holes exist until eventually, you realize that there’s not a single one. It’s the reason that Inception should have bested that year’s best picture winner, The Kings Speech (2010) in the Best Original Screenplay category. However, this film is not written by Christopher Nolan; rather, it was written by Jon Spaihts and Damon Lindelof. To date, Spaihts has only written one other film, that being the story and screenplay to the disastrous The Darkest Hour (2011) and I am completely baffeled as to why the studio greenlighted the desion to have him as a co-writer. Yet, this film was written mainly by the latter of the two writers, Damon Lindelof has also only written one, bad screenplay to date, that being 2011’s Cowboys & Aliens (Screen Story by Mark Fergus & Hawk Ostby and Steve Oedekerk; Screenplay by Roberto Orci & Alex Kurtzman & David Lindelof and Mark Fergus & Hawk Ostby; based off the comic book by Scott Mitchell Rosenberg), However, that is relatively unimportant because he is really a television writer and won an emmy for his work on Lost (2004-2010), the hit television phenomenon, for which he co-wrote many of the episodes, including the much buzzed-about finale, and also co-created the show with Jeffrey Lieber and J.J. Abrams. For all of Lindelof’s talent though, he also comes with some baggage. He doesn’t really know how to make a script that makes sense. If I had to guess, this is because he spent so much time in dramatic, episodic television, which delves into highly complex characters because they have to keep you entertained so much longer than those in film dramas. So, why all the backstory on Lindelof? Because this story, similar to many aspects of Lost (or, so I am to believe) doesn’t quite make sense because they tried to do too many things. I actually don’t mind that except that if I were to not mind it, I couldn’t write this review. See, normally when you make an origin story or prequel, it should help us understand the situation or the characters more. Examples would include the X-Men trilogy paired with X-Men: First Class (2011) & X-Men Origins: Wolverine (2009); and the original Star Wars trilogy (IV: A New Hope (1976), V: The Empire Strikes Back (1980), and VI: Return of the Jedi (1983)) paired with the new trilogy (I: The Phantom Menace (1999), II: Attack of the Clones (2002), and III: Revenge of the Sith (2005)). This did not clear anything up, but it is interesting in that it is set up for two different sequels. 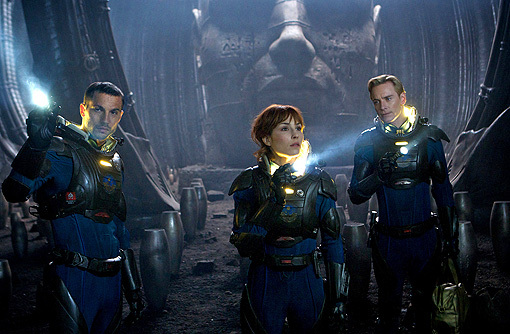 In one line, we can follow our protaganist, Elizabeth Shaw (Noomi Rapace) and the Hal wanna-be, David (Michael Fassbender), to the home planet of the Engineers. In another line, they set us up for the Alien franchise through a shatteringly upsetting final scene when a Xenomorph finally appears. The reason said scene annoys me so much is because I can see it. I don’t want to see it. That was what made Alien the legend that it is. It is nearly impossible to make a monster that can truly scare you. Alien’s quick evolution certainly helps but it is nothing compared to Scott’s ingenious direction, making the xenomorph stay shrouded in theshadows, never giving us a truly good look at it. It’s a lesson that Scott knew – as does J.J. Abrams as he proved in last year’s far superior film, Super 8 (2011). Here though, the alien is seen under bright, florescent light. That made me upset. Normally though, Scott proved his worth. Though he used some different tricks than those he did in ’79, I was absolutely on the edge of my seat for most the movie. Despite the scripts flaw’s, Scott managed to keep me thoroughly entertained and terrified, while also playing off the brilliance of one of my favorite films, 2001: A Space Odyssey (1968) in more ways than one. I do have one last thing to say though. There is one man involved in this project who deserves nothing but praise: H.R. Geiger. The artist won the Academy Award for Best Special Visual Effects for Scott’s original Alien and he certainly deserves academy recognition again, though I don’t know if he would be included in Visual Effects, Art Direction (my opinion), or Technical Acheivement. In either case, the original elements he created for this film are so Geiger and so stunning, it tended to make up for the crap that Lindelof mindlessly injected into this story (i.e. ripping off of Star Wars. What the hell was that about?!) .